Preview of the “Mountain Trek” artwork for the limited edition print being offered as part of one of the reward packages for pledging to the “Yeti Squad” embroidered patch artist merchandise campaign on Kickstarter. This artwork will be custom screen printed by hand on archival quality paper. This will be a signed and numbered limited edition. All backers of the Kickstarter campaign who pledge $25 or more will receive the print as part of their reward package. And since the campaign has already exceeded the funding goal, this project is guaranteed to move forward to production. In fact, we have already exceeded the first “stretch goal”, meaning all backers pledging $25 or more will get a “Yeti Squad” window cling added to their reward package at no extra cost! 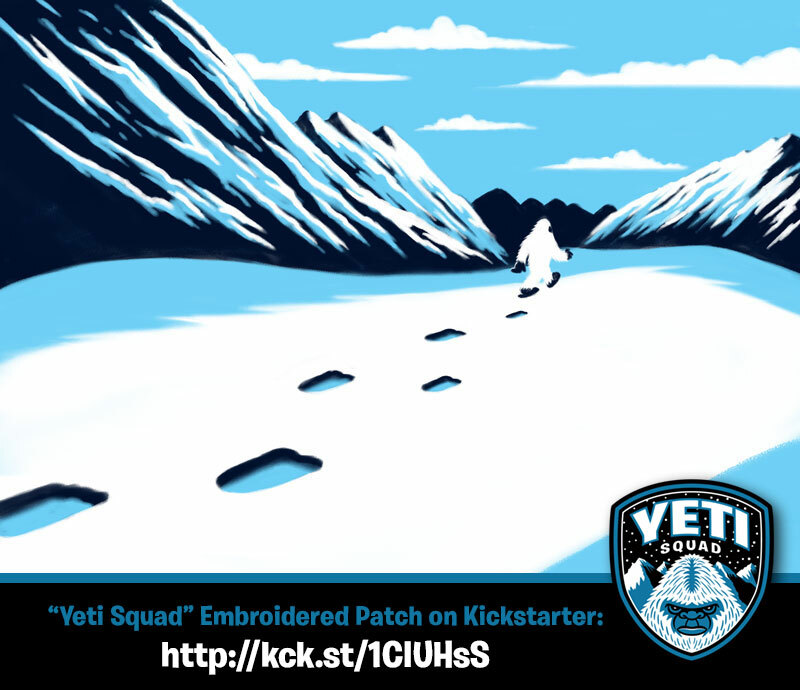 Head on over to the “Yeti Squad” embroidered patch campaign on Kickstarter and pledge now. Just a few days remaining to get in on this deal. Prices for the merch will be higher once the campaign ends! And you can also order the original “Bigfoot Patrol” embroidered patch as an add-on item. And yes, there will indeed be a followup campaign for a Sasquatch-themed patch later this year.